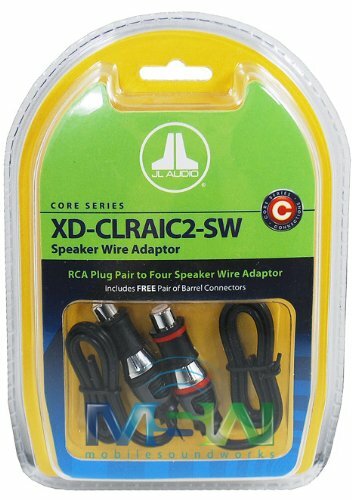 Boat part number 8201439 is a set of 2 new speaker wire adapters from JL Audio, part number XD-CLRAIC2-SW , commonly used in Four Winns boats, part number 028-3245 . May be used in other boats. This set of 2 speaker wire adapters is ideal for use with amplifiers that have high level input capability but no speaker wire input connections (such as the JL Audio "slash" series amplifiers).The molded RCA plugs are short to allow for easy installation in tight areas. Speaker wire inputs are color-coded. Sold as single unit which includes one pair of RCA plug to speaker wire Adapters and a free pair of barrel connectors. Instruction / installation manual included. Hardware not included.